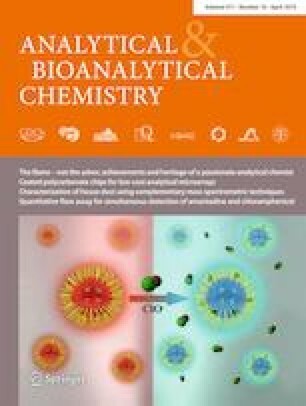 The development of simple and effective tools for selective ratiometric detection of hypochlorite (ClO−) is one of the most important goals for elucidating the biofunction of ClO− in associated diseases. However, most developmental probes suffer from the notorious aggregation-caused quenching (ACQ) effect that greatly limits their applications. 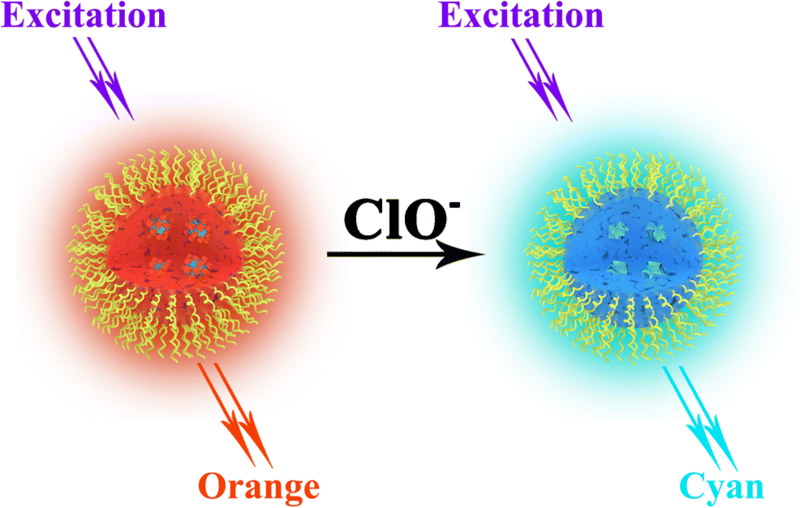 Herein, we report on novel aggregation-induced emission dots (AIED) for ratiometric detection of ClO− via a co-precipitation strategy. The AIED nanoprobe displayed a ratiometric signal output, which was more promising to minimize the bad environmental factors and simultaneously avoided the ACQ effect. Notably, amphiphilic block copolymer endowed the nanoprobe with stable water dispersibility and easy modification. The as-prepared AIED probe exhibited high sensitivity (~ 89 nM), high selectivity, outstanding photostability, and prominent long-term fluorescence stability. Furthermore, the as-prepared AIED was applied for the visualized fluorescence detection of ClO− and further utilized to detect ClO− in real samples. We expect the nanoprobe to be an outstanding tool to understand ClO−-associated diseases. Illustration of the probe for the detection of ClO−. Hong Wang and Yanyang He contributed equally to this work. The online version of this article ( https://doi.org/10.1007/s00216-019-01653-0) contains supplementary material, which is available to authorized users. We are grateful for the financial support of the NSFC (51773056, 51603067, 51873058, 21705040, 51373002), Hunan Provincial Natural Science Foundation of China (2018JJ3143), China Postdoctoral Science Foundation (2017 M622571, 2017 M622568 and 2018 T110824), Open Project Program of State Key Laboratory of Chemo/Biosensing and Chemometrics (2016019), Open Project Program of Key Laboratory for High Performance and Functional Polymer Materials of Guangdong Province (South China University of Technology) (20160005) and Hunan Provincial Innovation Foundation For Postgraduate (CX2017B622).